The Gadget: A semi-solid cushion for your laptop that separates hot aluminum from fleshy thighs, plus has a small space to store random things (like your charger). The Verdict: Alright. It does what it says, which is giving you a small cushion between your laptop and your thighs. 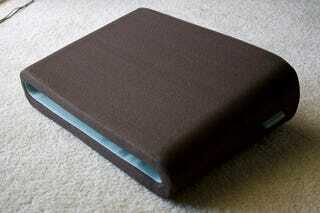 It's better than a normal pillow because it's flat, and gives adequate airflow for proper ventilation. The little hiding hole is enough for you to shove your iPod, wallet, or various computer accessories into, but it's really meant for you to put your laptop into for storage when you're not using it. Update: The version commenters are seeing at Costco for $19 is actually the previous design, not this current one which retails for $39.